Peated whisky: because what’s the point of drinking whisky if it hasn’t been heavily flavoured by thousands of years of decaying organic matter? I mean sure, when you put it like that maybe you can understand why peat tends to split whisky drinkers into two distinct camps. Some compare it to licking an ambulance brake pedal, and some compare it to licking an ambulance brake pedal and are genuinely excited by the idea. Regardless of whether this appeals, if you want to learn more about whisky, you need to learn a little about peat, because this mysterious substance has the amazing ability to impart rich and unique flavours into your glass. So how does peating whisky work? Dried peat has been used as fuel in Scotland for hundreds of years. Peat bogs are naturally occurring ‘carbon sinks’ i.e. areas that accumulate and store carbon-containing chemical compounds for an indefinite period. In fact, peat is so good at this, that it is the most efficient form of carbon sink on the planet and dried peat will produce more energy than coal when burnt. As well as this, peat is unique to bogs, mires and moorland – the sort of areas that appear in quite high frequency in, shall we say, the damper areas of Scotland, such as the north-west Highlands and the islands of Islay and Jura. Thanks to these excellent energy rates, peat has therefore been used in the whisky making process for hundreds of years, and the primary way that peat’s distinctive flavour characteristics make their way into your dram is through its use as a fuel source in the malting process. At this stage in production, the germinating process which has been started by soaking and turning the barley needs to be stopped, and this is done by the application of heat. Traditionally this was provided by a peat-fired kiln which caused the malted barley to absorb a significant quantity of peat smoke (depending on the drying time and the distiller’s preference). Perhaps surprisingly, this flavour is so strong, so persistent and so recognisable that it survives the entire distillation process, making its way through the mash tun, washbacks, stills and warehouse to remain detectable in your glass of whisky. 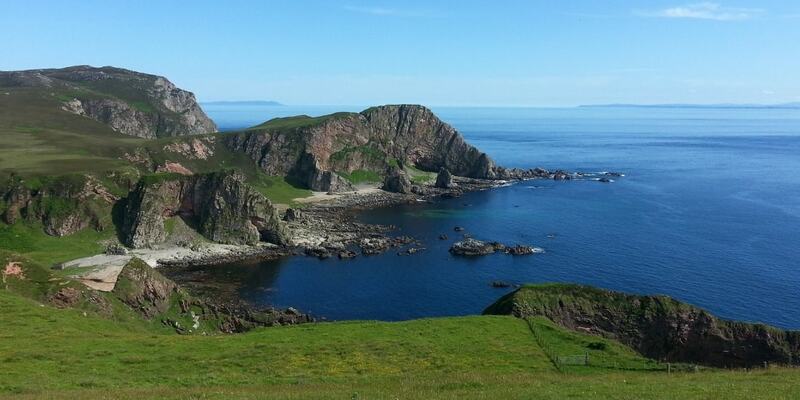 Is Islay the only place for peated whisky? And where is peat used? Now, when people talk about peated whisky they generally think of Islay malts, but the use of peat isn’t limited to Islay now, and certainly wasn’t in the past. A number of factors means that peated whisky is still mainly linked to the islands and western highlands however. This is partly because these are the areas where peat preponderates, but also because many Lowland and Speyside distilleries took the opportunity to switch to firing their kilns with coke (a processed form of coal) when access to the railways made this a viable and cheaper option. As a result, for many years, the perception has been that if you want a peated whisky you need to head to Islay. So what does peat bring to whisky? In a very literal sense, peat is terroir (take that, wine!). As a result, different peat will impart different flavours, and different distilleries will use peat for different length of time when drying their malt. If you want to get technical, the concentration of peat in whisky can be measured by PPM (phenol parts per million). Phenols are the class of compounds in peat smoke which are retained by the malted barley and their prevalence therefore has a big impact on taste. On Islay, whisky can range from 1-2ppm up to 54ppm. What does this mean? In terms of tasting notes, a peated whisky is likely to give you sulphur, smoked meats, iodine, rich bonfire smoke. If this sounds good to you, perhaps you should explore some Islay whiskies? Why not start at Lagavulin? The oldest distillery on Islay can trace its (unofficial and highly illegal) history back to a collection of small bothy distilleries in Lagganmhoullin dating from 1742. These were brought together into a legitimate business in 1816, which means that the brand has been producing highly-regarded peated single malt whisky for at least two hundred years now. The old settlement of Lagganmhoullin is now a small town on the Lagavulin bay where the distillery is positioned - open to the wild weather of the north Atlantic, which gives the spirit a lot of its coastal aromas of seaweed and smoked fish. 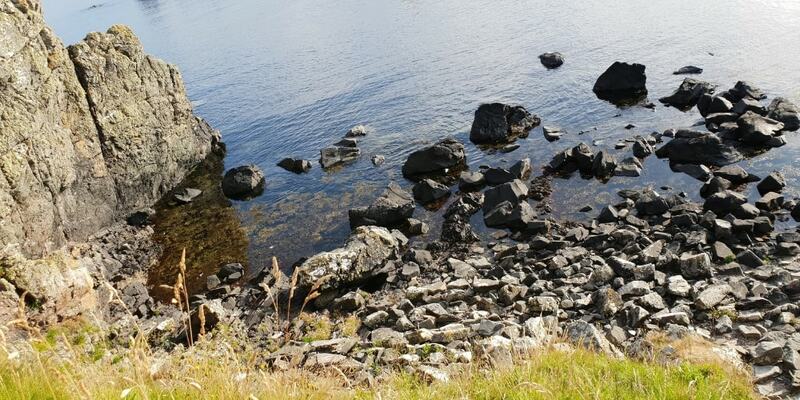 This coastal spot also provides a distribution route with the distillery owning its own Clyde puffer up until 1956, meaning barley could be brought in by sea and finished spirit sent back down to Glasgow with just a slight detour around the Mull of Kintyre. Both the peat and water are locally sourced, as they always have been - the Illeachs wouldn’t have it any other way – and the two intertwine on their slow descent to the distillery from Lochan Sholum, inland and 200m above sea level. From here the water flows two and a half miles to the distillery, soaking up moss and peat, but don’t get confused. At this point the peat contributes only colour and a slight tang to the water – as it takes on the same shade as the finished whisky – the smoky flavour comes almost exclusively from the kiln. 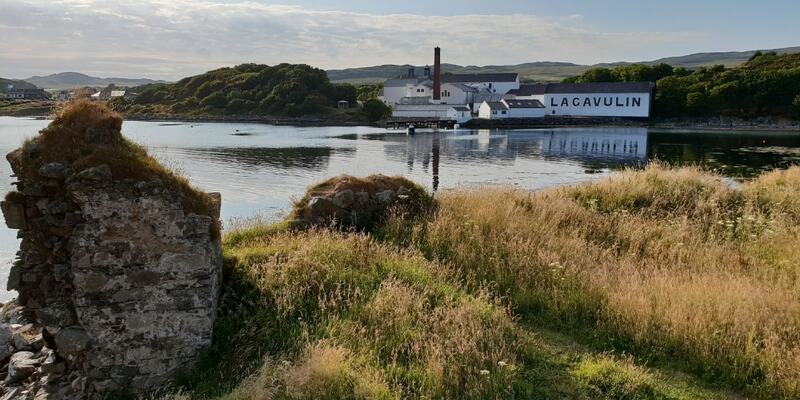 Lagavulin no longer malts its own barley – the floor maltings closed in 1974, but they procure their own specific recipe from the Port Ellen maltings. It is dried over peat for a high proportion of the total drying time giving a final phenol count of around 37ppm. After the excitement of distillation, the spirit rests in the coastal warehouses, seawater pooling on the earthen floors and breathes steadily for 8, 12 or 16 years before bottling. Maturation allows the spirit to soak up the atmosphere of this unique setting and takes just a slight edge off the wild smoky flavour of all that centuries old organic matter. Yum. 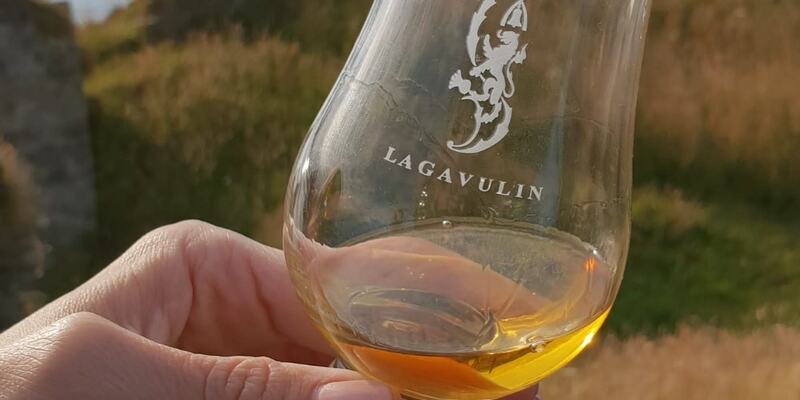 Lagavulin 16 Year Old, 43% ABV, around £49 for 70cl – Long-time standard bearer of the range, dominated by Lapsang Souchong, hints of pipe tobacco, smoked fish and iodine. A classic Islay single malt. Lagavulin 8 Year Old, 48% ABV, around £52 for 70cl - Originally a limited-edition to mark the distillery’s bicentenary in 2016, but now part of the core range this expression is all woodsmoke, tobacco and pepper. 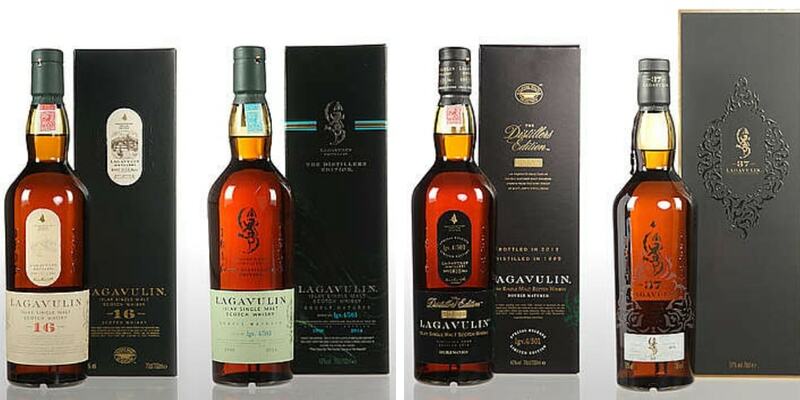 Lagavulin Distillers Edition, 43% ABV, around £74 for 70cl - Double matured in Pedro Ximenez casks, this is a mellow Lagavulin with flavours of seaweed, Christmas cake and sea salt. Want to see The Three Drinkers cutting peat at Laguvalin in the sunshine? Watch The Three Drinkers do Scotch Whisky, now streaming on Amazon Prime!